Hotel Fron offers a variety of great accommodations options, single and double rooms , suites, studio apartments and larger apartments. 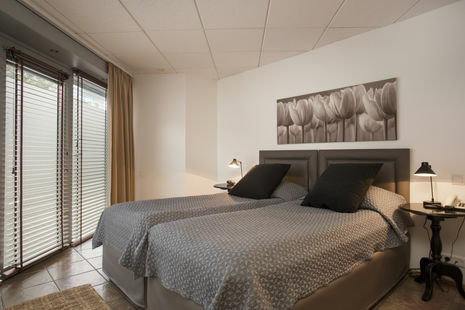 Hotel From offers a variety of stylishly furnished apartments accommodating up to five adults. We at Hotel Fron are committed to providing our guests with an excellent standard of service and a warm and welcoming environment. We offer free Wi- Fi, dry cleaning, room-service, car-parking and more. The restaurant Scandinavian offers Nordic Cuisine and a great variety of dishes prepared with high quality Icelandic ingredients. 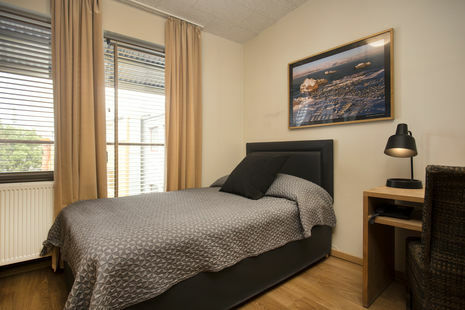 Hotel Fron is ideally located in the heart of Reykjavik, only a few steps away are cafés, restaurants, shopping, galleries and theatres. 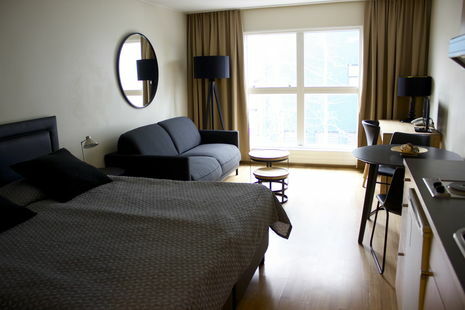 Hotel Frón is located in downtown Reykjavik close to all the main shops, restaurants, cafés, galleries and museums. We pride our selves in providing great friendly service. Do not hesitate to ask our staff for some assistance while staying at Hotel Frón. The restaurant Scandinavian offers a variety of dishes in a cozy atmosphere. The focus is on Icelandic and Nordic cuisine. Hotel rooms we offer both single and double or twin rooms. 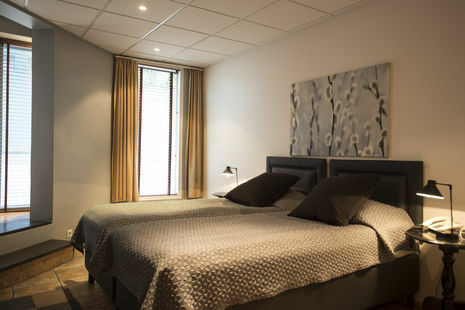 Our stylishly furnished single rooms combine modern facilities with a welcoming atmosphere. Each room is fitted with parquet flooring, a 120 cm bed, an attractively tiled en-suite bathroom with a shower, a direct-dial telephone, a minibar, satellite TV, a safe to store valuables and wireless, free high-speed Internet access, hairdryer. 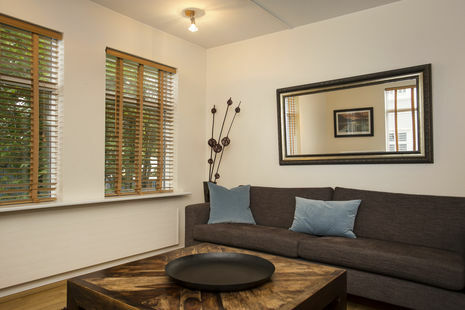 Our two-person rooms are elegantly furnished, modern and stylish. Guests have a choice between a double room (with one bed wide enough to accommodate two sleepers) and a twin room (with two separate twin beds). Each room features parquet flooring, an attractively tiled en-suite bathroom with a shower, a direct-dial telephone, a minibar, satellite TV, a safe to store valuables and wireless, free high-speed Internet access, hairdryer. Our luxurious and stylishly furnished suites combine modern facilities with a welcoming atmosphere. Each suite is fitted with parquet flooring, an attractively tiled en-suite bathroom with a bathtub, kitchenette, a direct-dial telephone, a minibar, satellite TV, a safe to store valuables and wireless, free high-speed Internet access, hairdryer. Very elegant and stylishly modern apartments for two persons. These smart and very comfortable apartments are fitted with a kitchenette, parquet flooring and a beautifully tiled en-suite bathroom with a shower. Guests have a choice between two twin beds or one queen-size double bed. 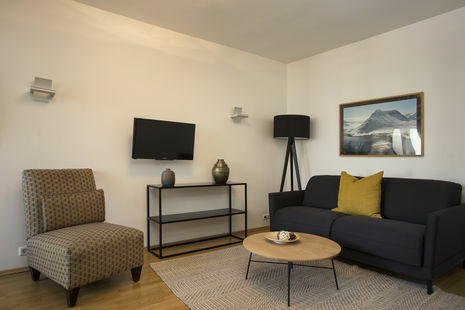 Each studio apartment comes with a direct-dial telephone, free high speed Internet access, a minibar, satellite TV and a safe to store valuables, hairdryer. Luxurious apartments for up to three persons. Very stylish and comfortable, the apartments are fitted with parquet flooring, a kitchenette, two single beds and a sofa bed for the third person. The en-suite bathroom is beautifully tiled and includes a shower. The apartments are equipped with a safe to store valuables, a minibar, satellite TV, free high-speed Internet access,direct-dial telephone, hairdryer. Very elegant and stylishly furnished apartments, fitted with a kitchenette, parquet flooring and an attractively tiled en-suite bathroom with a shower. The bedroom can accommodate up to three people. Each apartment comes with both a double bed and a sofa bed for the third person, in addition to a safe deposit box, a minibar, satellite TV and a direct-dial telephone, hairdryer and free high-speed Internet access. Very stylishly furnished and elegant two-bedroom apartments accommodating up to four adults or a family of five. The apartment consists of three sleeping quarters and are fitted with a kitchenette, a dining room and a parquet-floored living room. The en-suite bathrooms are tiled and feature a shower and hairdryer. Other en-suite facilities in the rooms include a direct-dial telephone, a safe to store valuables, satellite TV and free Wi-Fi. 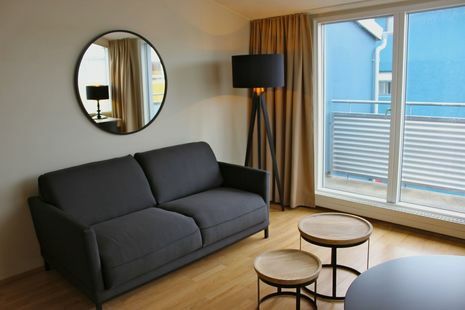 The Penthouse Apartments are elegantly furnished in a Scandinavian style with a beautiful terrace over looking Reykjavik. The apartments have two bedrooms with large queen beds suitable for two couples or a family. The apartments have parquet flooring, a kitchenette, a bathroom and a living room. The en-suite bathroom is stylish with a walk-in shower and equipped with a hair-dryer. The penthouse apartments are equipped with a safe, a minibar, satellite TV, and internet access.